This week’s words for the 2010 Cherokee County Spelling Bee are from Greek, and can be found on the National Spelling Bee web site, http://www.myspellit.com. Friends’ Yard Sale is May 7 & 8. Annual Auction is August 7. Don’t miss either! Here are two dates to remember: May 7 & 8, 2010 and August 7, 2010. Friends of Murphy Library are holding a yard sale on May 7 and 8 at the library. Now is the time to start cleaning out your closets. Besides donating items to the sale, you will be assured of space for new treasures. And there are always good deals to be had. Then, on Saturday, August 7, the Friends’ will hold their annual auction. Librarian Jeff Murphy can’t wait to see what handcrafted items, antiques or gift certificates will be donated this year. Anyone who’s been there knows it’s more than an auction – it’s a demonstration of the kindness of the community of Murphy and Cherokee County and how much they love their library. Looking forward to seeing everyone at both these sales. Donations can be brought by the library. volunter Jacob Dorn arranges the refreshment table at Friends of Murphy Library's 2009 auction. The fundraising group has scheduled the next auction for August 7, 2010. And — there’s always good food at the refreshment table! Bob MacLean is one of our new Friends of Murphy Library board members. Recently he was doing some banking in Murphy. Let’s let Bob tell you…. 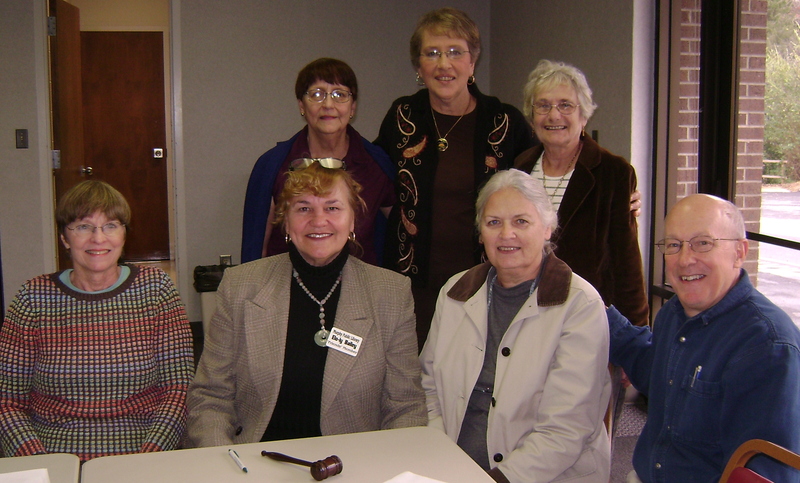 Bob MacLean (front row, right) joins the Board of Friends of Murphy Library along with Diane Hines, Elo-ly Bailey and Louise McDonald (front row, left to right) and Nora King, Sonia Roberts and Claire Groff (back row, l to r). King is now Fundraising Chair. Bob MacLean recently reported on the success of donation boxes at BB&T Bank. Thanks to Bob MacLean for this feedback -and thanks for Nora and Larry King for bringing a good idea to fruition. Most of all, we appreciate all our volunteers for good ideas and the hard work that makes them successful! This week’s words for the 2010 Cherokee County Spelling Bee are from Italian and music is the theme. They can be found on the National Spelling Bee web site, http://www.myspellit.com. 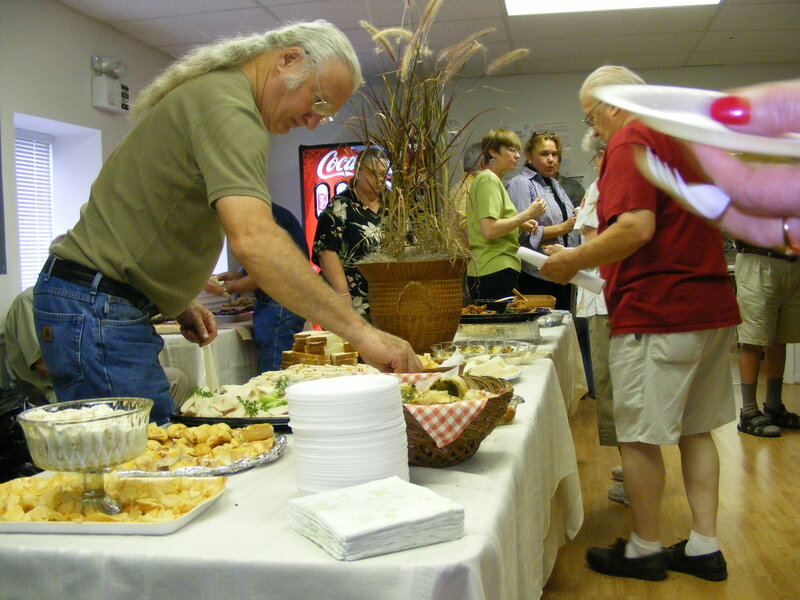 Due to bad weather and roads, Friends of Murphy Library is canceling its Potluck Meeting tonight, Tuesday, February 16. Silver Arts NC State Medalists will be honored at the February 16 Friends’ Potluck at 6 p.m. Everyone welcome! Gayle Larson learned to play the spoons at her Great Aunt Sue’s house on Turkey Ridge in Pennsylvania. Sunday afternoons Great Aunt Sue played the pump organ, two uncles played a homemade banjo, and after she learned rhythm playing a bucket with sticks, they taught her to play the spoons. 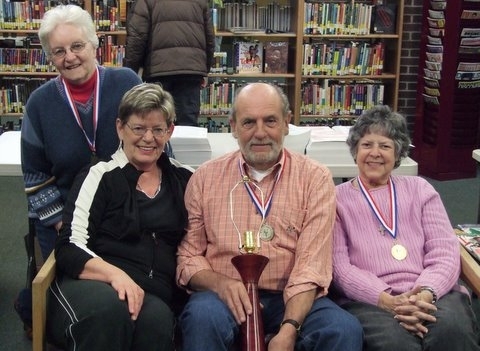 Larson will play the spoons at the February 16 Friends of Murphy Library quarterly pot-luck. The dinner will spotlight SilverArts NC State Medalists where Gayle Larson won a 2009 gold medalist for performing. The public is invited to bring a dish and join the 6 PM meeting. NC State SilverArts medalists seated, left to right: Jane Hembree, photography; Marshall Peterson holding his winning woodworking lamp; Millie Crawford, needlework; standing Gayle Larson, performing arts. One of our favorite MCs, Jane Hembree, will be introducing the winners. Jane won the 2009 Silver Arts Bronze Medal for photography. She is a long-time FML board member and past auction chairman. Millie Crawford, 2009 bronze needlework medalist, is an FML member and craft shows participant. 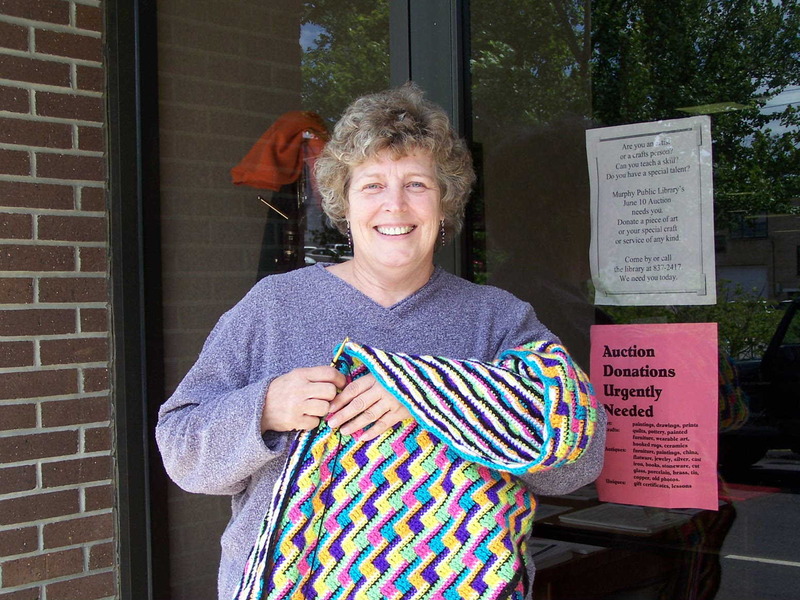 Kathy Hoyt, 2008 gold medalist in knitting, is a founding member of FML, and its first Treasurer. Loye Merwin, 2009 gold medalist for jewelry and Marshall Peterson, 2009 silver medalist for woodworking will also be honored at the dinner. Marshall Peterson restored and refinished furniture, and four years ago began wood working. His winning lamp, of African paduak wood, is made of 23 different rings and instead of being turned, is shaped by sanding beginning with 40 grit and finishing with 400. His work is available at galleries in Stecoah and Bryson City and the Campbell School Fall Festival. 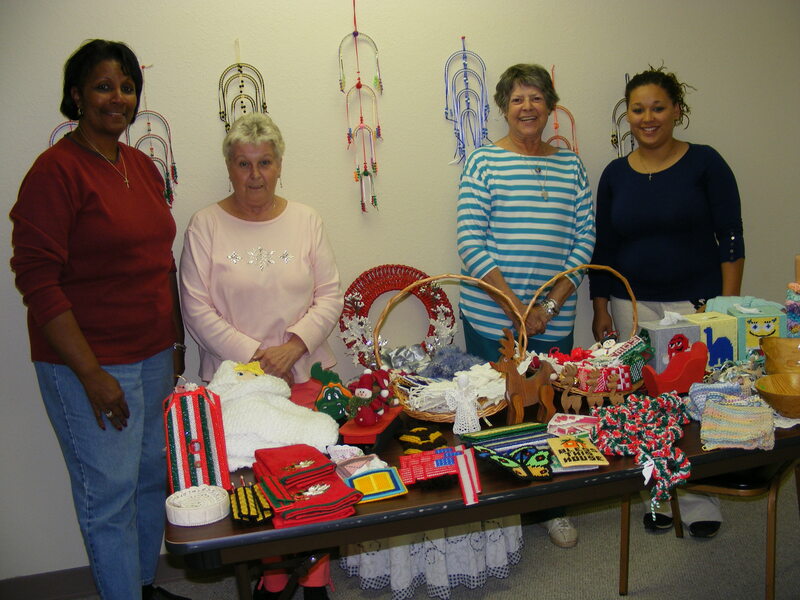 Millie Crawford (2nd from right) stands with her co-workers at the Penland Senior Center. She won the Bronze Medal in the 2009 Silver Arts for needlework. Millie Crawford has won 60 ribbons and a best of show at the Florida State Fair in Tampa. Her biggest plastic canvas was a Barbie Castle, 30″ high with six rooms which she made for her granddaughter. She also crochets and frames names for gifts. Millie works at the Penland Senior Friendship Center. Richard Argo will read his prize-winning poem at the Feb. 16, 2010 Friends of Murphy Library potluck. 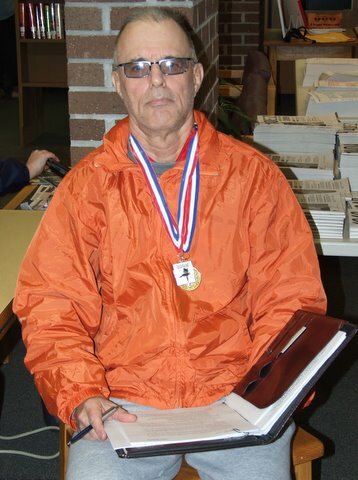 Richard Argo and Jane Hembree exemplify the Senior Games/SilverArts slogan, “A healthy body, a healthy mind,” because they are local medalists in both Senior Games and SilverArts. Richard won medals in swimming and tennis, and Jane has won shuffleboard doubles and baseball throw. Besides Larson’s “spoons concert,” Argo, the 2008 state Silver Medalist, will read his winning poem at the dinner February 16. He is a FML Writers Workshop writer.